When Is Purple Heart Day 2019? Purple Heart Day is an observance that commemorates the creation of the Purple Heart Medal in 1782. Is Purple Heart Day a Public Holiday? Purple Heart Day is not a public holiday. Businesses have normal opening hours. Thank soldiers for their service today. The holiday also encourages people to pay their respects to fallen soldiers, to listen to the stories of soldiers and veterans, and to thank them for their service to the nation. The Purple Heart was first created on August 7, 1782 by the commander-in-chief of the Continental Army, General George Washington. Then known as the Badge of Military Merit, it was awarded to 3 Revolutionary soldiers in 1783. After the end of the American War of Independence, no medals were awarded until 1932, when the medal was revived on the bicentennial anniversary of George Washington's birth. According to a circular dated February 22, 1932, Purple Heart Medals were to be awarded to those wounded or killed while serving in the United States Armed Forces as a result of enemy action on or after April 5, 1917. The United States officially joined the First World War on April 6, 1917. At current estimates about 1.8 million Purple Hearts have been awarded since then. 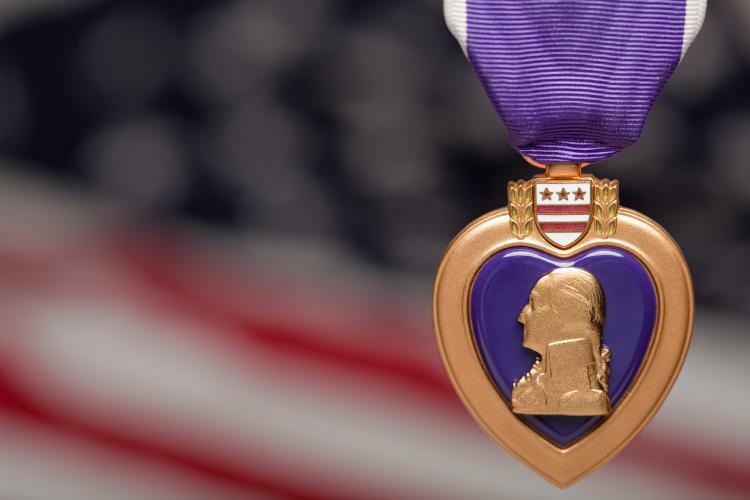 Today, in addition to being awarded to those who fight wars overseas, the Purple Heart is also given to military personnel who display bravery and valor as prisoners of war and while fighting certain types of domestic terrorists. The Purple Heart is a heart shaped purple medal with a gold border. The front has a profile of George Washington, while the back has the words for military merit inscribed on it. The medal is attached to a piece of purple silk with a silver border. The observance is also called the National Purple Heart Day, Purple Heart Appreciation Day, and Purple Heart Recognition Day. Purple Heart Day is an unofficial observance. This means that businesses, government offices and public transport do not close on this day. Veteran and military organizations hold remembrance meetings for fallen heroes and special events to thank soldiers, veterans, and Purple Heart recipients on this day. Many people fly the American flags at their homes and businesses as a way to show their solidarity with the troops. The Purple Heart Foundation, the fundraising arm of the Military Order of the Purple Heart, recommends donating time and money to the foundation or to other organizations working with Purple Heart recipients and their families on this day. They also encourage people to listen to soldiers and veterans and learn more about their life stories and their military service.